The action of Oblivion revolves around a harrowing attempt by the player characters to prepare the survivors of Perdition for the coming onslaught of the Nether‘s native creatures. In the process they will struggle to thwart their own human enemies, meet new and powerful forces, and perform a daring raid on the lair of the dark alliance of the UltraMax Psychos and Embracers, culminating in the rescue of the one man who can give hope to stop the tide of evil. 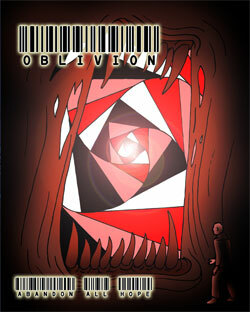 Oblivion marks the final installment of the first campaign for Abandon All Hope, the “Incursion”.